Myles’ new work is an investigation into the artist’s “complex balance between nature and nurture.” As questioned by Myles, is it “the nature of the material or its natural reaction to the application process and the artist’s manipulation or nurturing of the material?” The work presents the viewer with a staggering representation of the power of aesthetics and ideology. Myles has a BFA and a BS form Culver-Stockton college. Since returning for college Myles has been a part of groups shows all around Saint Louis. 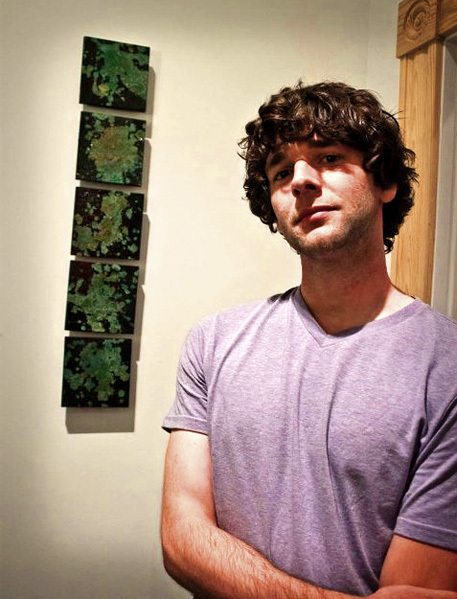 He can be found at the Art Dimensions Gallery and Studios @ 2720 cherokee, where he is the current gallery director. Recently he has had a solo show at the Saint Louis Artists Guild “Shiny Means Its Done” and a exhibit at Concrete Ocean “This is air only.” He is also planing two shows coming in fall 2010 on cherokee st.